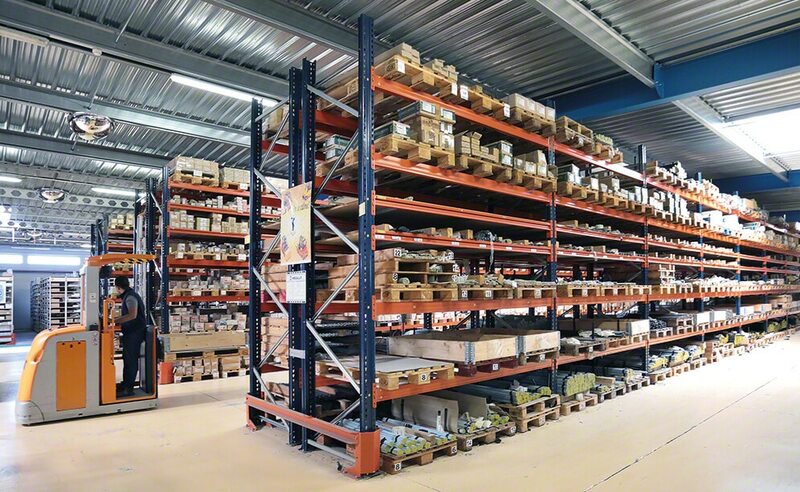 SPB, an enterprise specialized in hardware items, has equipped its Avignon (France) warehouse with various storage solutions: Movirack mobile racks, selective pallet racks, picking shelves and drive-in racking. Created in 1982, SPB started out in a small premise near Avignon. Six years later, the company moved to an industrial zone in the city outskirts. In 1998, after experiencing remarkable growth, the company was compelled to relocate its logistics center in the same area, where it currently has 1.73 acres at its disposal. More than half of this surface is set aside for storage. Nowadays, SPB’s international presence grows stronger. To provision its vast portfolio of customers in different countries, SPB has a warehouse capable of managing more than 20,000 SKUs. In the pallet racks for heavy loads, located in the central warehouse area, picking is carried out directly from pallets or off the shelves. The upper racking level is used to store palletized reserve stock. In the medium-duty picking shelves, measuring 33' long and 13' high, smaller-sized products are prepared for orders. These are nine levels high with shelves. The combination of both storage systems adapts to the wide variety of products SPB carries. These were distributed taking into account their demand and turnover, which allows for streamlined picking. They were supplied nine Movirack mobile racks and two stationary units at the ends. In total, 2,400 pallets of 32" x 48" are stored here that weigh up to 1.1 t each. The racks are 26' high and take up approximately 4,520 ft2 . This high-density system eliminates aisles, all but the one required, and provides optimum storage capacity. Racks rest on mobile bases that move both laterally and autonomously. To guarantee that the system functions properly, the block of Movirack mobile racks has its own control cabinet, as well as onboard cabinets in each of the racks. The PLC is in the control cabinet, which is responsible for directing and processing movement commands. In turn, the power regulators synchronize the three motors in each base and soften start-up and braking to extend the life of the components contained in the racks (wheels, motors, guides, etc.). The Movirack units incorporate external and internal barriers with photocells, which stop all activity when operators work inside the aisle, thus guaranteeing the maximum safety of the installation. Counterbalanced forklifts and reach trucks handle the pallets in the selective pallet racks and in the Movirack mobile racks. The latter machine reaches the highest level of the Movirack mobile racks, which turns out to be ideal for this type of solution. High reaching order pickers give access to products deposited on any level of the picking shelves. The operator can access the machine controls on one side and the pallet on the other, speeding up the extraction of goods. Moreover, pallet trucks are employed to handle pallets in short distances manually. Maximum storage capacity: the installation’s surface is optimized with a mix of the different solutions, enabling the storage of more than 20,000 SKUs. Direct pallet access: the storage systems supplied by Mecalux make easy access to any of the stored pallets possible. A safe installation: the Movirack mobile racks come with all the elements needed to guarantee top safety for both the operators and the merchandise.